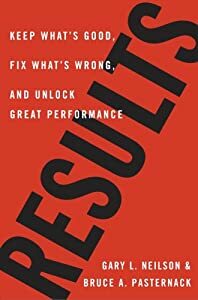 There is a book named Results and it looks at various organizations and their cultures. The book was written by Gary L. Neilson and Bruce A. Pasternack (Crown Business, October 2005, 320p). The purpose of the book is to identify the personality and characteristics of various businesses. As an internet business owner, you are faced with choosing the attitude and approach you will take to insure success. Much of the success of any organization lies in its ability to be resilient. If you start a business and tell yourself from the start that it will probably fail…then it probably will. If you are an internet marketer and go off on tangents every time new technology is introduced, and don’t finish what you started or abandon efforts too early, then you will probably fail. New shiny object syndrome (NSOS). On the other hand, if you don’t learn to adapt to the technology that can benefit your business and to changing market preferences, then you will probably fail. You can over manage your business to death; never set any goals; or refuse to adapt to the internet markets. You will probably fail. So much of succeeding is dependent on attraction marketing. Success begins in the mind. The book The Resilient Organization is a business management book. It was not written as a Law of Attraction marketing book. So it is amazing that the description of the resilient organization starts with lines that could have been taken out of Think and Grow Rich. Resilient companies benchmark themselves – not against others in their industry, but against the theoretical limits of the human imagination. They take the view that anything that can be conceived can be done. Resilient companies do not follow fashion. They do not succumb to the latest business fads, nor do they court the fancy of Wall Street. By the same token, resilient companies do not accept the status quo as an article of faith simply because “that’s the way it’s always been done.” They chart a strategic course based on their best instincts and information, and they stay the course as long as their own market intelligence validates it. Resilient organizations do not ignore squeaky wheels; they listen and learn. Resilient organizations act on complaints and end up making positive changes to the organization that accrue to the benefit of everyone, not just the original complainer. As you can see from these passages, the Law of Attraction pervades even business management books though the termis not used. A resilient business takes ideas formed in the mind and really believes they can become reality. Using their instincts, successful business owners meet market challenges with a positive attitude. And complaints from even customers are seen as opportunities to improve customer service rather than getting defensive. In fact, a business that responds quickly and fully to customer service complaints has a chance to become a “hero” in the eyes of its customers. So the Law of Attraction marketing says you must be resilient, customer focused and positive. These three qualities will carry you to success.